If you've been thinking to yourself, gee I would love to see a new Mewtwo form, then today is your lucky day. However if you've dreaded the thought of that, today would be a bad day for you. Revealed in CoroCoro 13/04/2013, the mysterious Pokémon shown above is a new Mewtwo form. I know, I know, I groaned too, but look on the bright side, we can always kill it with fire! How Mewtwo turns himself into this form has yet to be established, but I'm sure all will be revealed in time. Mewtwo and Genesect are due in the 16th movie: Extremespeed Genesect: Mewtwo's Awakening. Which.. should be quite clear from the name. Nosey on Sun 07 Apr 2013 00:24:06 UTC. Utack and Swampy on Sun 07 Apr 2013 05:50:17 UTC. Richard and Blaziken on Sun 07 Apr 2013 08:37:39 UTC. I don't completely hate it. I think it could be cool to see what they do with it. I'm hoping it's a new Pokemon altogether that has a link to Mewtwo somehow. Perhaps the first legendary to evolve? Umby2000 on Sun 07 Apr 2013 13:28:49 UTC. Salagross on Mon 08 Apr 2013 02:26:20 UTC. Shaymin on Sun 14 Apr 2013 10:34:09 UTC. on Sun 21 Apr 2013 03:11:54 UTC. From the picture, its toes are fat, swollen grapes and it has a failed breast. Well, the breast makes it look more like an alien. However, this form looks premature and undeveloped--like a sickly baby. 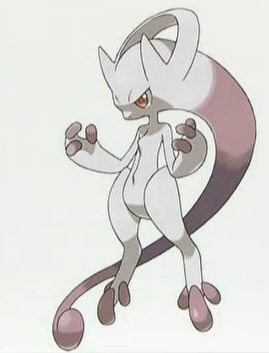 An anorexic Mewtwo. I'd like the alien-extent to its head to be more separate than blended right in. In conclusion, it's ugly. But it is a relief to think about it supposed to be an alien. That's the way it looks, and if it's based off a clone-alien, it's not that bad.